"Rational Preparedness" : The Blog: What is Atrial Fibrillation ? We hear this phrase a good deal, and yet most adults have no idea what it really means. Atrial fibrillation is the most common of heart rhythm disturbances. A heart rhythm disturbance is also known as a type of arrhythmia or most correctly, dysrhythmia. "A-fib" as it's often abbreviated, can occur suddenly and can be experienced in a variety of ways. Most people with "a-fib" experience a sensation of either fluttering in their chests or the sensation that their heart is flopping around. This may come in tandem with the sensations of being slightly breathless and also anxious. Most people feel an energy drain and may even be a little lightheaded. A few people with atrial fibrillation have odd sensations in their throats and a very few complain of unusual sensations in their left arms or even in their deltoid muscle of their left arm. Some people develop an episode of atrial fibrillation during a period of acute stress. Some develop it after getting insufficient sleep or after too much caffeine. People can be in atrial fibrillation for a few minutes, for an hour, for several, and some, for years. Beside the obvious discomfort and the feeling of general unwellness, there are other reasons that atrial fibrillation should not be allowed to continue. A heart beating irregularly and inefficiently can allow clots to form. These clots can later be liberated and can cause a stroke. 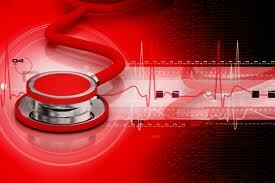 Therefore the rapid diagnosis of actual atrial fibrillation, and the treatment of such is important. Atrial fibrillation can run in families. My father believes that he had brief episodes of a-fib all the way back to grade school. He was not diagnosed with atrial fib. until he was in his fifties and on a business trip out of town. His initial diagnosis and treatment occurred in New York City. Both his mother and his father were diagnosed with a-fib in their fifties. My grandmother, after diagnosis and treatment, lived well with this tendency, until she was 96. My father was challenged by recurrent atrial fib. from his fifties periodically until his eighties, and at times, his energy levels were impaired. One of my children has been treated for a-fib and is currently stable. My son who died of an acute rhythm disturbance, believed to be Long QT syndrome, was not felt to have had a-fib. The development of atrial fibrillation at some point is therefore very likely for me. I have a cardiologist lined up, ready to treat me for this eventuality. Atrial fibrillation is usually diagnosed when the patient himself complains of feeling an "odd heart rhythm". On taking their pulse, they have a clearly irregular rhythm. Anyone of any age, who has an irregular heart rhythm should be taken to a competent emergency room at once. Once they are there, an EKG will be taken in an attempt to document the type of rhythm disturbance. A rhythm strip showing atrial fibrillation is immediately obvious and is easily diagnosed. This is an enlarged view of a rhythm strip, a portion of an EKG, showing atrial fibrillation. In this strip, the heart is beating inefficiently and irregularly, and there are opportunities for clots to form and be thrown throughout the body. I have added a normal tracing here for comparison. This tracing is of a normal sinus rhythm. Once a physician has diagnosed atrial fibrillation, they usually obtain some labwork. This is done to rule out other issues and to check fluid and electrolyte balance. Having low amounts of any blood electrolytes, particularly potassium can cause many patients to descend into atrial fibrillation. Then an intravenous line is started. In many places a cardiologist is called, although most board certified emergency room physicians are fully capable of treating atrial fibrillation. The patient will also need an echocardiogram, an ultrasound exam of the heart which helps to rule out a number of potential causes of atrial fibrillation which could need to be addressed. The potential causes of atrial fibrillation are many. This arrhythmia can occur in tandem with coronary artery disease, or completely independently of it, as it appears to do in my family. For some people , another illness has depleted their electrolytes and the atrial fib. is simply a symptom of another poorly controlled disease process. For others, too high a dose of another drug given for another issue, has been administered for another problem, and has caused the a-fib. For a few, they have ingested too much caffeine in the form of soda, tea or coffee, and this has caused a fib. Excessive use of alcohol, college parties with excessive alcohol ingestion, or tobacco can also cause this. Excessive thyroid hormone from either your own thyroid gland, or from excessive thyroid supplementation from your physician can also cause atrial fib.. Excessive asthma medication can also cause atrial fibrillation, but then so can poorly managed asthma. Once echocardiography, an ultrasound examination of your heart is done, many of the issues above can be ruled out. Some people simply have atrial fibrillation without any of the issues listed above. These are people who may have additional nerve pathways in their cardiac conduction system which periodically trigger a competing rhythm. 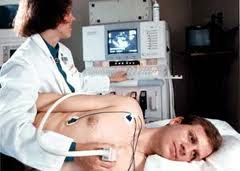 This is a person receiving an echocardiography exam. 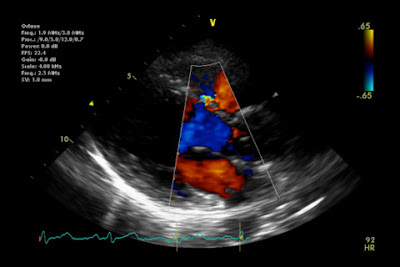 This is one view of an echocardiogram. A great deal of information can be obtained by looking at the measurements as determined by this machine. In my family, no particular cardiac abnormalities have been found that were felt to cause a-fib. Still, this can be a serious and potentially life threatening issue if not addressed. Once controlled, it can simply be monitored. My grandmother for example, had a-fib in her fifties, and it was controlled using a very small dosage of medication, until she passed of something else entirely at 96. For others, there can be a more frustrating course. Treatment can include medications, surgery to correct abnormalities found, or something called cardioversion, in which a very slight shock is delivered to a sedated patient to correct a rhythm disturbance. This is not anywhere near the magnitude of the shock delivered during a code situation. A few people with recurrent a-fib will not respond to drug correction or to cardioversion, and their best option for complete recovery will be cardiac ablation . One of my sons had a cardiac ablation in his twenties and is living and well today. In cardiac ablation, the cardiac conduction system of the patient is mapped using a catheter which enters the patient through a small opening in the groin. When the focus which is causing a competing rhythm is identified, it can be burned slightly as if done with a cautery. For many patients, this ends their proclivity for a-fib. A few need to have the procedure performed once again. Atrial fibrillation is the most common of the cardiac conduction disorders. It is a fairly common disorder and occurs much more often as we age. It does run in families. There are multi-factorial causes, and therefore a multitude of treatments both available and necessary to restore the patient to a regular sinus rhythm. Returning the patient to a regular sinus rhythm is necessary because their energy level, general function is impaired while they remain in atrial fib. and because their chances of having a stroke are greater, the longer they remain in it. Even when a person converts to a regular sinus rhythm following a period of time in atrial fibrillation, they likely remain exhausted and feel "spent". People in atrial fib or who have recently concerted are often given anticoagulants in order to prevent their formulating clots in the period of time following the correction of their rhythm disturbance. This is a common cardiac disorder, and under todays diagnostic and treatment capabilities, this disorder can be controlled for many people. I mention this, fourteen days before Valentine's Day, because in a survival forum, this is indeed something that we can do something about. The person for whom atrial fibrillation is diagnosed early, has an excellent chance of living a normal lifespan and living through other health challenges or challenges in our world. Continued atrial fib. and heart failure from longstanding a-fib. can be avoided. Strokes from untreated a fib can certainly be prevented. This month, I am seeing a friend who is a cardiologist, and getting a new baseline EKG and a new baseline echocardiogram done. This might be the best Valentine's Day gift I can give my husband, and the rest of my family. Just spent the day having a chemical stress test. As you said in regard to Valentine's Day, this may be the best Christmas present I can give my loved ones, to follow-up on issues that seem to be getting worse. And then, by the grace of God, to do something about those things, whatever it takes. That's the hard part. Yes Marie, It's a loving thing to do to have annoying tests done in order to be here to not only raise our children but to help them through the transitions and into parenthood themselves. I try to do all the right things, but testing is always still expensive and annoying. You did a good job today, and I am glad you know that. Why Would We Install a Carbon Monoxide Detector ?